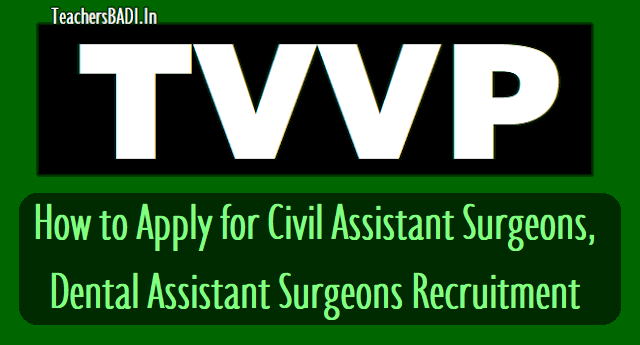 How to Apply for TVVP Civil Assistant Surgeons, Dental Assistant Surgeons Recruitment 2018, Online applying precedure for Civil Assistant Surgeons, Dental Assistant Surgeons Recruitment 2018, Online application form filling instructions for Civil Assistant Surgeons, Dental Assistant Surgeons Recruitment 2018. Candidates shall apply for the posts mentioned in the Notification under the control of the Telangana Vaidya Vidhana Parishad, Telangana State, Hyderabad for appointment on regular basis only through „ONLINE‟ at website www.tvvprecruit.telangana.gov.in from as per its schedule. i) Fee of Rs.600/- need to be paid Online using Payment Gateway through Net Banking / Credit Card / Debit Card. ii) The Fee once remitted shall not be refunded or adjusted under any circumstances. Failure to pay the Application fee will entail total rejection of application. iii) IPOs / Demand Drafts are not accepted. TVVP ID reference No. : TVVP ID reference No. will be generated in the subsequent steps shown below and candidates shall make a note of this TVVP ID reference No. for future references, related to the Notification. Steps to be followed in submission of application online. PROCEDURE TO UPLOAD THE APPLICATION FORM: The candidates shall read the Instructions mentioned in the notification and go through the User Guide on Website before submission of Applications online. The candidate has to click on the “Application Fee Payment” present in the website and pay the application fee for the post he wants to apply. PAYMENT PROCESS: The candidate now has to click on the payment link against the post.. The candidate has to verify all the details that were displayed from OTR. Hence if any details are to be changed in Application payment screen, candidate should use the Modify Profile link in OTR (STEP-I), modify the details, save it and again click on Application payment link. STEP-III: After checking all the data and ensuring that the data is correct the candidate has to fill application specific data. Once all the data is filled appropriately, the candidate has to submit the payment form. On successful submission, the payment reference ID is generated and is displayed on the screen. By clicking “OK” the candidate is shown the various payment options where he/she can select any one among them and complete the payment process as given on the screen. NOTE: In any case if the payment process is not submitted successfully, then the candidate should start the fresh payment process as mentioned in STEP-II. STEP-IV: Once the payment is successful, payment reference ID is generated. Candidates can note the payment reference ID for future correspondence. Thereafter the candidate is directed to the application form. The candidate should check the data displayed thoroughly and should fill the application specific fields‟ details carefully and submit the Application form. Once the Application is submitted successfully then Application Preview is generated. The candidate is requested to take a printout of the Application for future reference/correspondence/verification of documents. Note: Candidate shall note that the details displayed from OTR (STEP-I) at the time of submitting the application will be considered for the purpose of this post/notification only. Any changes made by the candidate to OTR (STEP-I) will not be considered, after the successful submission of application. 1) Pass Port Size Photo of the Candidate (<50 kb jpg, jpeg). 2) Signature of the Candidate (signed with Black Pen) (<30 kb jpg, jpeg). 4) Contract Service Certificate/(s) (<150 kb .pdf). candidates shall visit the website: www.tvvprecruit.telangana.gov.in and download the proforma of Contract Service Certificate (available under Notifications Tab) as per para 13 (i)(6) of Tab “Civil Assistant Surgeon Specialists” under Notifications. If the candidate has qualified in more than one speciality and desires to apply for more than one specialist post, he/she has to submit a separate application for each speciality online duly paying the prescribed fee of Rs.600/- for each application. The Department is not responsible for any discrepancy in Bio-data particulars while submitting the application form through Online. data entry is processed only based on the particulars furnished by the candidate by the Computer. Candidates should, therefore, be very careful in Uploading / Submitting the Application Form Online. Incomplete/incorrect application form will be summarily rejected. The information if any furnished by the candidate subsequently in any form will not be entertained by the Department under any circumstances. Candidates should be careful in filling-up of the application form and submission. If any lapse is detected during the scrutiny, the candidature will be rejected even though he/she comes through the final stage of recruitment process or even at a later stage. Before Uploading/Submission of Application Form, the Candidates should carefully ensure his/her eligibility to the post he/she is applying. No relevant column of the application form shall be kept blank, otherwise application form will not be accepted. For latest updates on Recruitment, candidates shall check website www.tvvprecruit.telangana.gov.in regularly.